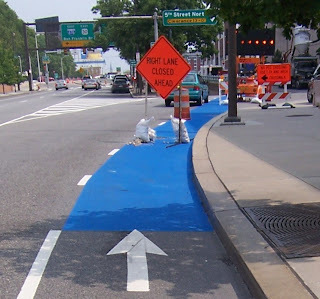 Greater Philadelphia Bicycle News: Give Us Back Our Bike Lanes! Give Us Back Our Bike Lanes! Here is a a great example of street repair projects that tear up bike lanes. Why has the contractor placed the right lane closed sign in the bike lane? This forces cyclists to move into the traffic lane as the road slips into the dimly lit 5th Street Tunnel under the Ben Franklin Bridge. A disaster (and lawsuit) waiting to happen. Contact the Streets Department and tell them to move the construction signs out of the 5th Street Bike Lane. This is not the only case that road work has messed with bike lanes, Slippery bridge plates 2 inches off roads are often used to fill in holes. There is also a problem of crews not replacing the bike lane or simply doing a sloppy repaving job .